Learn how to make a beautiful obento box in a private home located in central Tokyo. 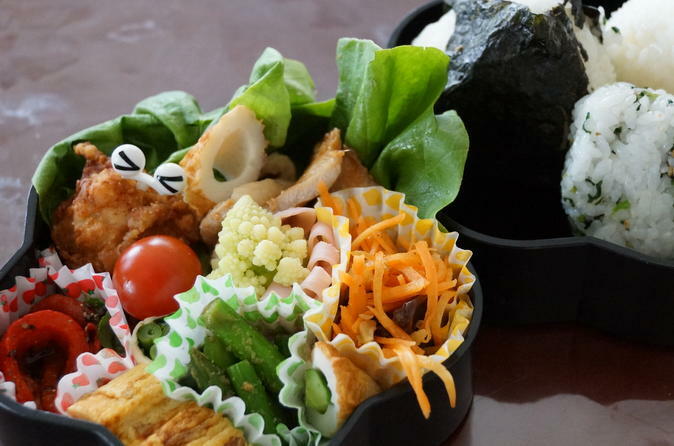 This 3 hour culinary experience will not only teach you how to make a beautiful obento box but also give you an opportunity to visit a Japanese home. You will learn the basic rules for making an obento box as well as techniques on how to make the most beautiful and tasty obento fillers that can be easily made back home. The class takes place in a private home located within walking distance from Meguro or Gotanda Station of the JR Yamanote Line. You will be greeted by the instructor which will start off by a brief lecture on the basic rules when making a obento box such as nutrition, color, taste, and hygiene, followed by the order in which it should be filled. Next, the instructor will demonstrate how to make a versatile sauce made from simple ingredients that can be used to cook various Japanese dishes. Using this sauce, she will show you how to make at least 1 main dish 3 vegetable side dishes, a tamagoyaki (Japanese Omelette) and an onigiri rice ball. After the demonstration, you will get a chance to make your own onigiri rice balls and fill your own obento box. There is an vegetarian option for this course where the main dish (chicken) can be changed to Tofu or a vegetable. After the obento box is completed, there will be a tasting session served with hot or cold tea. Aprons and a disposable obento box will be provided and an English Recipe Sheet to take home. Everything you will learn in this class can be served not only in an Obento box but also on a dinner plate for a full course meal.